Kerala has become the first state in the country to have four international airports with the inauguration of the Kannur airport on Sunday. Civil Aviation Minister Suresh Prabhu and Chief Minister Pinarayi Vijayan jointly flagged off the inaugural Air India Express flight, carrying 186 passengers to Abu Dhabi, at the airport near Mattannur town in the morning. 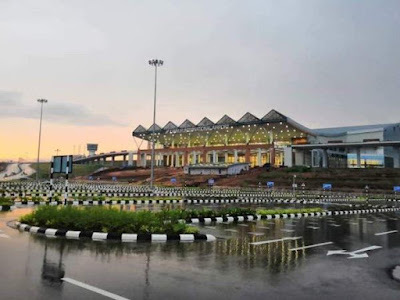 With the commissioning of the airport, the state has become the first in the country to have four international airports, with Thiruvananthapuram, Kochi and Kozhikode being the other three. 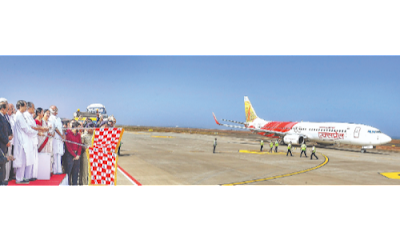 The airport depicts not only cultural traditions of Malabar and Kannur but also of Kodagu in neighbouring Karnataka. Virajpet in Kodagu is just only 58-km away from the airport, while district headquarters Madikeri is around 90-km away. Mural paintings depicting the heritage of Malabar and Indian dance forms, including Theyyam of north Kerala, Kathakali and Yakshagana, the traditional theatre art form of Karnataka, are among the artworks that vie for attention at the airport. The Kannur airport, built on a public-private partnership mode, will become a new benchmark of how airports will be constructed in India. The airport will help the non-resident Keralites, especially in the Gulf region, besides boosting tourism and exports, which will result in several job opportunities, Prabhu said.